This loyal indoor cat needs a kid-free, quiet home with a patient caregiver. Xena can be a very loving, affectionate, and cuddly four legged friend; however, she needs someone who will let her take her time to get to know them. She is very protective and wary of strangers which can translate to an unfriendly demeanour. She needs a new home as she is too territorial of her space with a toddler son in the family. After almost two years of patience, she still will not let him interact with her and will not tolerate any physical contact with him. This is a difficult situation. 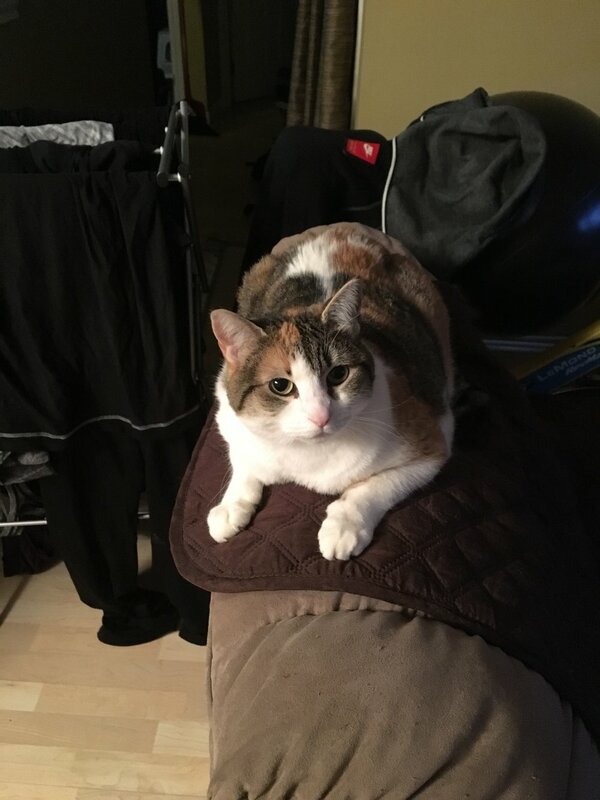 Xena is almost nine years old, has all her immunizations, has all her teeth in good condition, has been spayed, loves ice cold water and eats dry food. Her current family loves her very much and she is incredibly affectionate when nobody else is around. She loves having her face, neck and back rubbed and often purrs so loud they think the neighbours can feel the vibrations. Unfortunately, because she can’t/won’t get along with their son, they don’t feel it is safe having them in close proximity all the time. They also feel it isn’t fair to her that she to be confined to whatever room their son isn’t in. This is a courtesy post. Please contact Linda at catadopt@shaw.ca re contact information. Bobbie needs a home! Bobbie is a senior male who is healthy and has pet insurance. He is a lovely old gentleman who was left behind in an apartment since his senior owner was not able to take him when he left. Bobbie is sweet and friendly. He needs a quiet home of his own without other cats or dogs. A home with a senior would be ideal, but cats his age nap a lot so if you are at work all day that would be okay too. The landlord of his old home is trying to find a good home for him and boarding him in the meantime as she is working out of town. 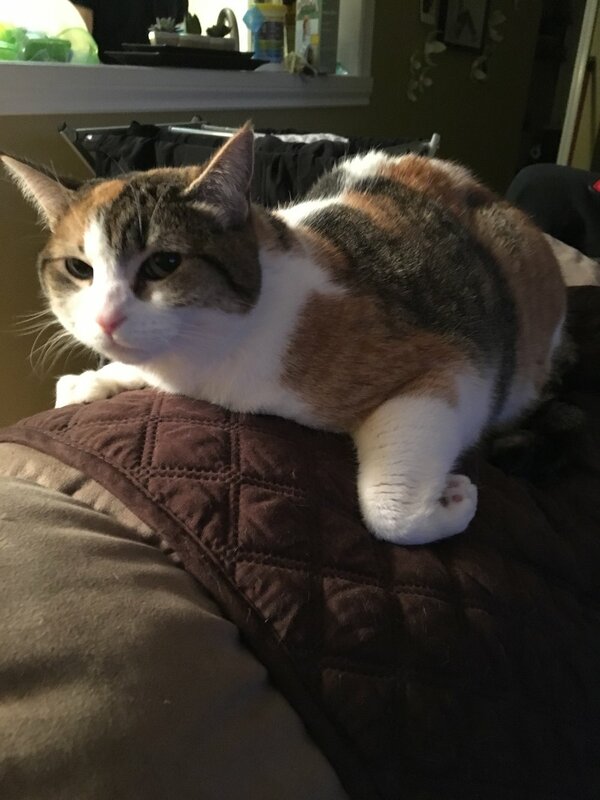 If you can help Bobbie, please email us at catadopt@shaw.ca and we will connect you with the woman seeking the home as this is a courtesy post. Armani is being placed in a great home with a senior couple who understand his personality – independent, feisty, and very sweet! Amelia and Lily finally found a great home. They are with one lovely woman who has a quiet lifestyle that suits them very well. They are really blossoming with her! Amelie lived on the streets for a good part of her first year of life. She had a litter of 4 and moved them around a neighbourhood in Esquimalt to keep them safe for a few weeks when finally a human found them in her garage and made a call to have them rescued. Amelie and the kittens were cared for by Linda and her team at Helping Homeless Cats. The kittens were separated from their mom in order to help them to become more adoptable (as they had varying degrees of a feral nature). Amelie and one of her children, Lily, were reunited after about 6 months of being apart and they bonded immediately. Amelie is a very shy and a little skittish. She likes to observe and get to know you and will likely never approach you. This doesn’t mean, however, that she doesn’t crave cuddles. When she is in her comfortable place on her scratch board and you approach her with her comb she becomes very open to your loving touch and petting. She actually really likes to have her ears gently pulled! Last year Amelie ended up with a serious dental issue and all of her teeth had to be removed. She now has the freshest breath and is very happy – and she still is able to eat her favourite dry food! She is very playful, especially at night when the humans have gone to sleep – we know this because we find her favourite mouse toy in the most unusual places each morning. Lily is very shy and will hide from view initially … but once she warms up to her human friends she is incredibly loveable and craves cuddles - she becomes completely submissive and like jelly in your hands. She will approach you and jump up on the bed or the sofa to keep you warm and happy with her purring. We think she should have been called Scout because she always likes to be the first to see what’s going on. She loves playing with ping pong balls, and the laser light! It’s best to ignore them initially until they’ve had time to listen to your voices and smell your scent… And when their human friends are seated either at the table, or perhaps watching TV, they will emerge from their hiding places and come to check you out – tentatively at first and then with more and more confidence. They very rarely eat treats and need to stick to their special diet from the vet. They live indoors and are comfortable there – never seeking to escape into the outdoors. 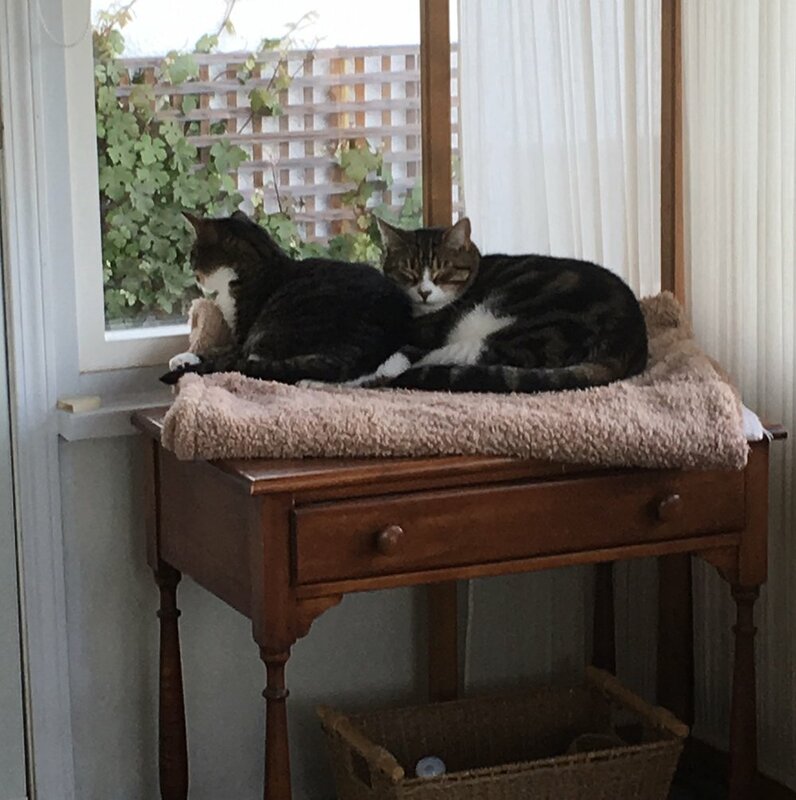 They like to watch the birds and smell the fresh air through the screened window. 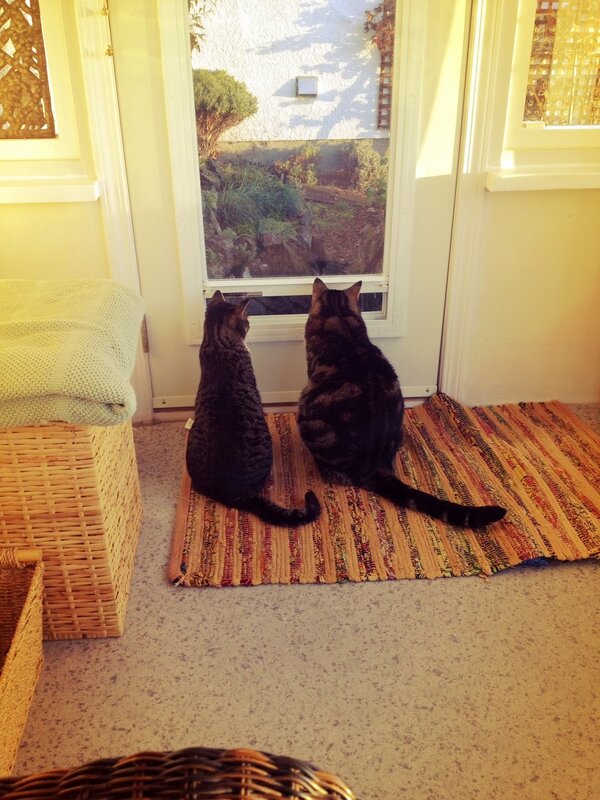 Pip and Meri were adopted together to a great home! Both cats are about over 10 years old and in good health..
TJ aka Jack has been adopted to a fabulous home that he shares with aYorkie. He finally has the wonderful life he has always wanted. 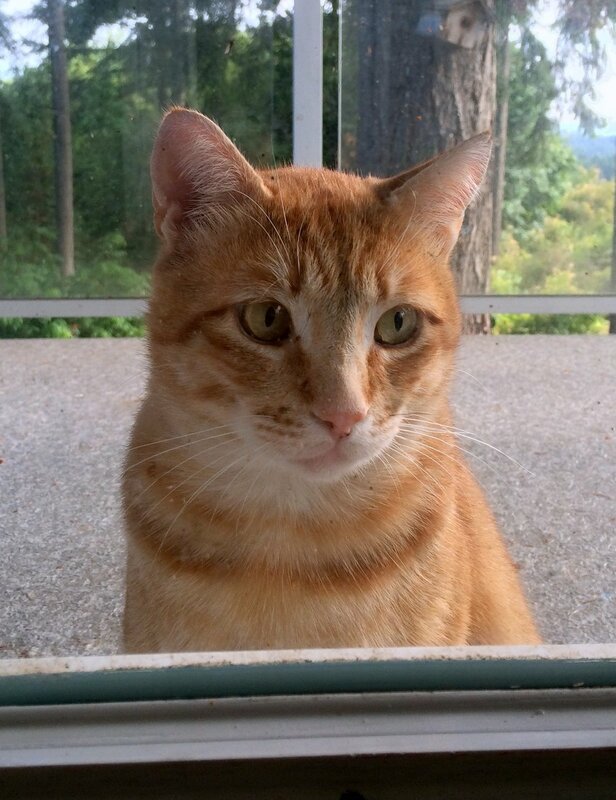 Chumley has been adopted and has a wonderful home of his own with a couple in a 3-story waterfront house where he can run up and down steps and relax in a sunroom watching seagulls. We are happy for him after his long wait! Buddy Jr. has a fabulous home. He was fostered and his foster mom fell in love with him and he now has a furever home! 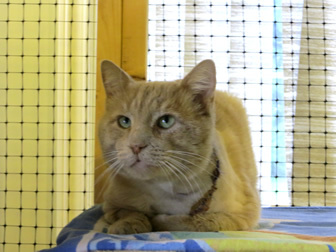 Buddy is under 5 and is an affectionate and very friendly kitty. He is very healthy and is a very sturdy boy. He is playful and cuddly. His only problem is that he tested FIV positive which has slowed down his ability to find a great home. However, this will probably have no effect on his health or longevity! He is a nondominant cat and will get along with other nondominant cats. Buddy needs an extremely secure indoor home with NO access to the outside (not even a patio). He is very smart and engineered an escape through a 4” x 7” hole (after dismantling a portable air conditioner vent) and jumped on a roof here. He did come back the same night, but if loose in the city it would be very dangerous for him as he was an outdoor country cat stray for his early years. We are looking for the perfect home for Buddy. He is a very special boy and very sensitive. He likes direct eye contact and wants to trust people. He will be a lovely best friend for the right person or couple. Although he would get along with children, he can have a feisty playful side where he could take a nip at a hand – and also could escape if a door wasn’t closed instantly – so we are seeking a home with no kids.